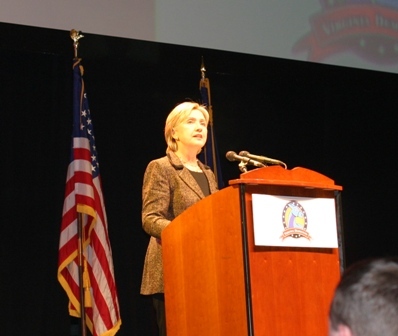 A new super PAC supporting Hillary Clinton for President has been launched. I saw the documents when they first showed up on Twitter a few days ago. Immediately, the name of the chair jumped out at me: Allida Black. We both served on Hillary’s Virginia steering committee, and were delegates for her in Denver. I’m a little slow – going to blame it on my cold: ) – took me a while to realize that the new Twitter account I’d just started following was associated with the PAC. Already, over 50,000 are following. If Hillary Clinton decides to run in 2016, she’s definitely got some support. Count me in. Not me!!!! I am truly glad to see out od the loop for the United Nations Arns control Treaty. I’d vote for her, but I also think this will inevitably cause you to dig out your grid about which demographic ranks two or three. I feel great respect for Hillary Clinton. She has been a champion of many issues, for most of her adult life. She has served in exemplary fashion and has brought credit and respect to this country by most of the world. She is one tough woman, and don’t think for a minute that if she decides to, she will run and give it 150% just like everything else.